Yesterday I went to the State Budget lockup. Basically they “lock” you in a room from 10am to about 1:30pm (when the Treasurer officially releases the budget) and you get to look through a big pack of budget papers before they’re revealed to the public. I took along the world’s slowest heaviest laptop so I could take notes and draft a reaction while we looked through the information. Thankfully, they do serve you lunch, and I’m happy to report there were some pretty good sandwiches on offer. Finance Minister Robin Smith Scott made a presentation (which was plagued by his computer continually going to sleep) and lots of officials and ministerial advisers were on hand to answer questions about the figures, which they did admirably (apart from one question I’m still awaiting the answer to). Certain catchphrases abounded. Apart from the (slightly meaningless) themes of “For families” and “getting on with it” seen in the literature, “the right project at the right time” was heard several times in the speech. Level crossings – 17 funded for $2-2.4 billion – and sensibly they’re aiming at Mckinnon and Centre Roads being in the first batch, so they can be done at the same time as North Road, Ormond. There’s also an emphasis on the Dandenong line in the ones initially funded. Mernda rail $9m – planning only, full funding later. Not unreasonable I think – it matches Labor’s promise, and you need planning to work out how much money it’s going to cost… indeed, it’s exactly what the local group was expecting. Bus service upgrades $100m (including $15m on bus/train integration projects) – this includes university shuttles for Deakin and Latrobe universities, which makes a lot of sense. Unfortunately it also means the rest of the money will be pretty thin once spread around to the rest of the bus network, so don’t expect improvements on your local route. Huntingdale station interchange upgrade $5.6m – makes sense, given the difficult interchange used by thousands each day. Plus $2.6m on parking – must find out how many spaces this buys. Bendigo metro rail $2m – hmmm the jury’s out on this one. I’m assuming this is planning money. Wouldn’t it be cheaper to trial local Smartbuses? Homesafe trial $50m – all-night trains and some trams on weekends – which will also fix the late Sunday trains problem. Bring it on! 37 high capacity trains $1.3 billion – intended initially to run the Dandenong line service, with those trains cascaded to elsewhere on the network. Comeng refurb $75m – keeps the 80s era trains running – so they’re not chucking out older trains yet, which is good. High-capacity signal trial $55.6m – stage 1 of Sandringham line trial only; sounds like it’ll only cover part of the line? E&OE. Some of the information is presented in quite a confusing way, so hopefully I haven’t doubled-up on any items, or left anything major out. So it’s a much more balanced budget than most, and there’s an obvious emphasis on upgrades for the rail network, which is welcome. Perhaps they really are serious about wanting to encourage growth in rail more than in roads, which is good. I didn’t spot anything new for cycling, though Labor had promised a new body “Active Transport Victoria” to help with cycling and walking issues. That might be one of the 4% of promises the government says they haven’t quite got to in their first budget. While there’s plenty for (heavy) rail, there’s not much for trams, and comparatively little for buses, so in terms of encouraging people out of cars, it’ll only go so far. Indeed, to really get the rail network humming (and cater better for crosstown trips), effective feeder services are essential. Relying on always limited car parking spaces at stations just isn’t going to cut it into the future. Thanks for your summary. I’m on the Sandringham line so it will be interesting to see what the High-capacity signal trial will look like. PS Glad you liked the sandwiches. Good use of public money! What about the electrification of Melbourne to Melton on the Ballarat/Serviceton line? Has that been tabled by PT for a while? Where is the airport rail link? We must be the only major city in the world without one. Yet there is 1.3 Billion to widen the freeway. Madness. What about Flinders Street Station upgrades? So I take it that we’ve just given up on expanding the tram network? It is great to see more low floor trams for the Melbourne tram network. Well overdue. Having said that, I would love to see production of the E class trams done at tripple the rate as which the factory can in fact do. We need to go low floor on a number of the tram routes as soon as we can. It is interesting how we are adding little extras on two production lines that are now 10 years old. The V/Locity and the Xtrapolis. I can not help but wonder if we shall be doing the same with E class trams and High-Capacity trains in years to come??? As for the bus upgrades, there are a number of upgrades that are to happen as part of this budget. The money allocated for the Bendigo Metro service, why not just use that money to run a single sprinter set up and down all day long. That would be a far better way of using the money than to be spent on nothing else but some cheap study on the project. It would have been nice to have had one budget that had nothing for road, and all that funding for public transport only. I just can not understand the high prices for consulting works. $9M for Mernder???? That could have built the line for sure. The Latrobe shuttle is nice, but it’s probably not going to be all that useful. The rail service out to Reservoir runs every 20 mins, so a frequent shuttle is going to be running empty most of the time. There’s already a relatively quick, direct bus (561) that runs every 20 mins – timetabled to take 9 mins which is only a minute slower than Google Maps says driving would, which, also connects with trains at some times. I can’t really see the service being successful unless the rail service is improved. Thanks for the breakdown Daniel. Its good to hear such a large increase in funding for public transport if only the federal government would do the same. Its disappointing to hear so much is focused on rail and little on trams and buses although this is quite substantial for PT in general as compared to both the Liberals and Labor state governments in the last 15 years. The $1.3bn for the Tuila widening is a mis-representation since $1bn of that spend will be provided by the private owner (Transurban), in exchange for an extension of the tolling period (by 1 year to 2035) and markedly increased tolls for trucks (the multiplier factor increases from 1.6x to 3.0x), So it’s user ays money, not tax payers money, which is a good thing. @James, I missed the Flinders St item – thanks, have added. Did i miss their mention of southland station? 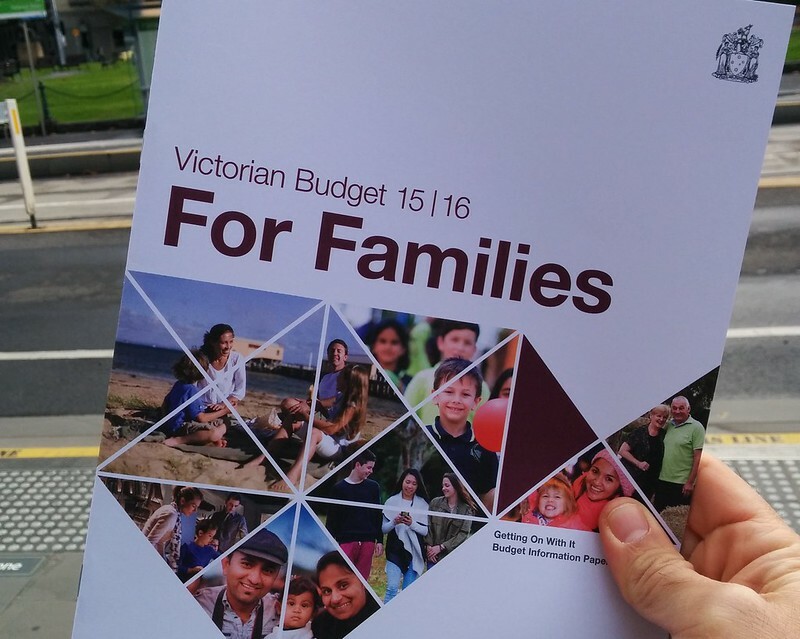 The budget papers should read “Melbourne”, not Victoria. There is very little in it for the rest of the state. The Coalition were crazy not to have started planning/funding Southland when they got in. It should have been in their first budget. It should have been finished before the election. When was the last time a state budget prioritised PT over private transport? The only time there would have been funding for major rail infrastructure in the past would have been the City Loopin the 1970’s although there was probably more funding for freeways as the first stage of the Eastern Freeway was built at about the same time plus investment in other freeways around Melbourne. @Llib, I figured it might’ve been back around the time of the Octopus Act. Agree with that so considering the history of PT funding, this new budget is the most positive result for public transport in terms of funding and I am generally sceptical of any government making genuine investments in PT projects. It couldn’t have come earlier as the metro rail is overdue and now includes Parkville, unless these projects get cancelled which would be hard to politically especially the metro and Pakenham/Cranbourne corridor this should put the new Labor government as the most pro public transport party in a long time.